This is ideal is a quick, healthy midweek meal. 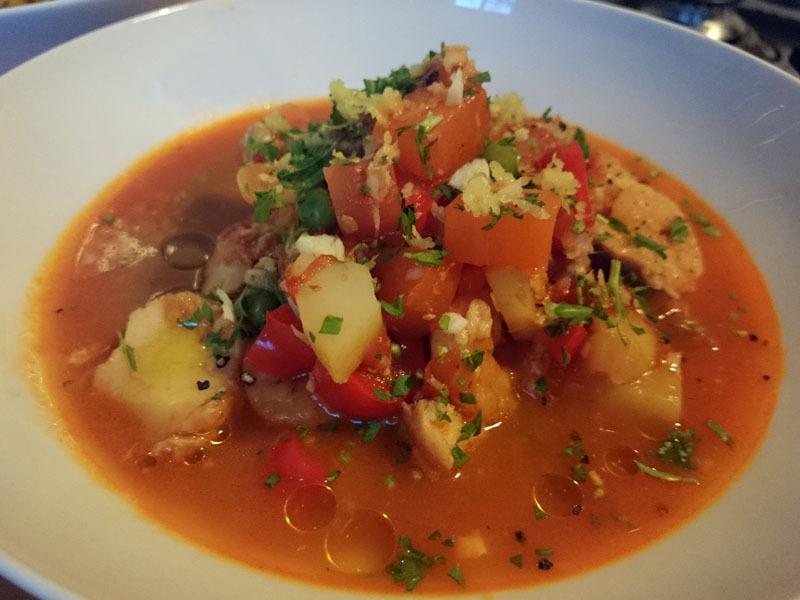 It's a pretty standard fish stew recipe that is made more special with a few simple fresh toppings that elevate the flavour. Add a glass of chilled white wine and pretend you're on holiday whilst blissfully ignoring the grey British weather outside. Heat the olive oil in a saucepan and gently fry the onion until soft. Add the chilli, garlic, paprika and continue to cook for a couple of minutes. Add the remaining chopped vegetables and saute for a few minutes. Add the tinned tomatoes, stock and simmer for 15 minutes until the potatoes are tender. Add the peas, fish and prawns and cook for a further 5-10 minutes until cooked through. Season to taste. Serve in bowls and top with a little of all the toppings, a squeeze of lemon juice and drizzle with olive oil. Enjoy with plenty of crusty bread.